Lowdown: A representative of an oil company is sent to a remote Scottish town in order to secure its purchase quietly so an oil repository can be built in its stead. My Local Hero story is as personal as an affair with a film can get. 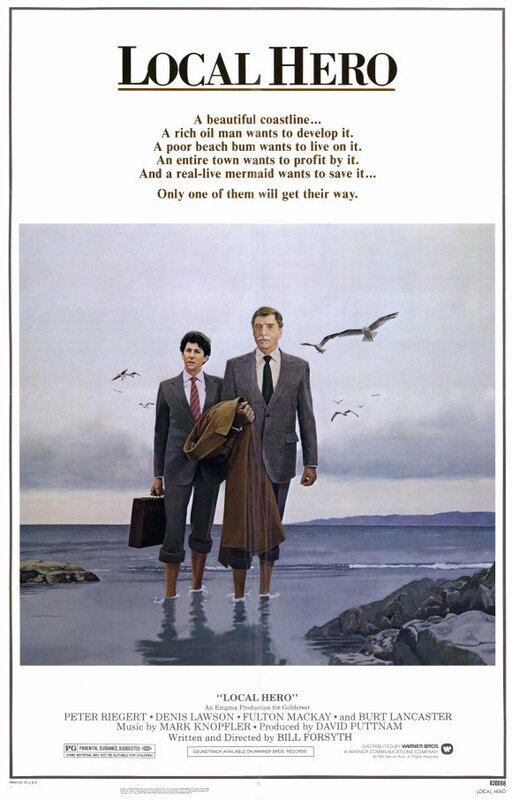 I watched this 1983 movie several times decades ago and never really took to it, but I always held a warm place for the Mark Knopfler soundtrack. Newcastle United may be using his movie theme for its home games, but I always play it in my head upon a homecoming. Recently, as chance would have it - or rather, as Spotify's random play turned out to be not so random - we got to listen to the soundtrack several times in succession. My wife asked me what this piece of music was, and I told her: I told her who wrote it, I told her what it was written for, and I told her what the movie was about, I told her I didn't find the movie to be that great, and I also added it was one of my best friend's favorite films (or at least used to be). The die was cast: we had to watch Local Hero. In retrospect, I am grateful for Spotify's inherent lack of randomness. Local Hero starts of at the headquarters of a giant Texan oil company. Ruled by an old tycoon (Burt Lancaster) that is losing it so badly he hires a therapist to shout at him because no one else would, the company determines the only way to secure the delivery of its North Sea oil is by building a giant repository on the Scottish shore. And the only viable place for that repository happens to be this peaceful, remote, tiny village. They send one of their bean counters (Peter Riegert) to secure the purchase of the land quietly and peacefully from the villagers, before anyone knows what is really going to happen and just how valuable the area has become. So our guy journeys all the way to the village, which - he finds - is somewhat similar yet very different to the company he represents. The local lawyer he's meeting to coordinate the deal with (Denis Lawson, of Star Wars fame) happens to also be the manager of the hotel he's staying at. And the cook. We continue to witness, through Texan eyes, the transformation going over the local residents as they realize they are about to become millionaires; we also witness the transformation in the lookout of our Texan as the little village grown on him. This little gem of a film, this tiny production, turned out to stir me much more than any other recent film I watched. It may be a small budget film from Britain but there is a lot to like about it: the whole story it tries to tell about capitalism and humanity, for a start. The satire on corporate culture, the stupidity of which we tend to witness in person and in the news all too often. And, of course, the whole thing about what is truly important in life. Yet what touched me the most was the way our giant oil company representative fell in love with the place he was visiting, a place he did not have much expectations of. It reminded me of someone I know going through the exact same transformation. Best scene: Our hero goes back home to Texas, has one look at his flashy yet empty inner city apartment, and realizes he went back to the wrong home. Cue in Knopfler's theme, one of the best there ever was. Overall: I might not have liked it before, but now I certainly have a lot to identify with. Local Hero gets 4.5 out of 5 stars from me. And it was a pretty big budget for Forsyth, after several small movies. And he probably caught a lot of flak for selling out to Hollywood. We have an injured rabbit also. No rabbits were injured in the making of the soundtrack.